FlatMobile – Responsive WordPress Mobile Theme Created by MobiusStudio. This templates have specific characteristics, namely: FlatMobile has features such as High Resolution: Yes, Widget Ready: Yes, Compatible Browsers: IE10, IE11, Firefox, Safari, Opera, Chrome, Edge, Compatible With: Facebook, WooCommerce 2.6.x, Visual Composer 4.11.x, Software Version: WordPress 4.5.x, Columns: 4+ . 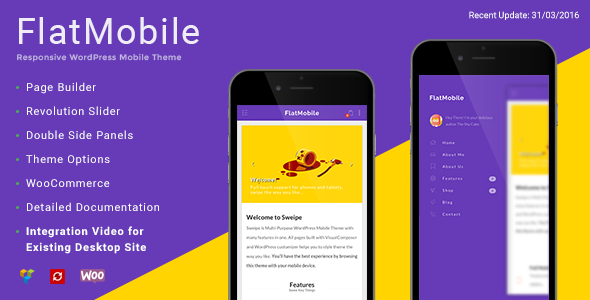 You can use this FlatMobile – Responsive WordPress Mobile Theme on WordPress category for flat, flat mobile, iphone theme, material design, mobile friendly, tablet theme and another uses. Easy installation with demo content is available. You can get your theme ready with some simple steps in 5 minutes. Everything you see on demo page is provided. If you already using a WordPress theme and you want to use a mobile special theme for mobile devices We included a guide for integration. There is written instructions for installation in documentation and also video guide to do so too. You will not have any head aches or frustrations while using FlatMobile! Creating new pages with FlatMobile is extremely easy and fast. You can simply drag and drop from between many elements and customize them for your needs. There are 10 option panel category to customize FlatMobile. You can personalize almost anything for your needs from different fonts to different colorings. Unlike generic option panels, When you use FlatMobile option panel you will see your changes immediately on the other side of your screen. This saves a lot of time! We ensured that to follow best SEO practices to help better rank your web site. You can also use best WordPress SEO plugins like YOAST or All in One SEO. With customization panel you can change color of almost every element. Also page builder provides color changes too. Everything you need for personalize is here. There are many custom sidebars where you can place widgets on.and also custom widgets. You can customize widgets for yourself and start using now. This theme tested with W3 Total Cache plugin and proved compatibility. If you ever need to use this plugin to improve performance We got you covered. English .pot file is included in theme folder, you can add your language and translate it. This theme is fully compatible with WooCommerce. Shopping pages are fully tested and ready to use. Product, cart, checkout and other pages are ready. We included child theme into FlatMobile. When you download theme you will also get child theme. We also described the installation and activation on documentation. You will receive theme update no matter what even you don’t buy support. Updating FlatMobile require only just a click with Envato WordPress Toolkit, so easy. 29.07.2016 - ver 1.9    - Compatibility: WordPress 4.5.3    - Compatibility: WooCommerce 2.6.4    - Update: Contact Form 7 version to 4.4.2    - Update: WooCommerce version to 2.6.4    - Update: Visual Composer version to 4.12    - Update: TGMPA version to 2.6.1    - Update: Kirki version to 2.3.5    - Fixed: Demo homeslider    - Fixed: Demo content file    - Change: Plugin packs in theme removed. Now all theme related plugins are hosted by Mobius Studio SSL enabled hosting.